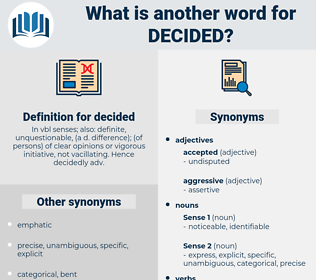 What is another word for decided? In vbl senses; also: definite, unquestionable, ( a d. difference); ( of persons) of clear opinions or vigorous initiative, not vacillating. Hence decidedly adv. Judgments, resolves, agreed, determination, determinations, determining. Adjudicated, choice, defined, declared, dictated, Acceded, concluded, directed, Deemed, discovered, elected, deducted, Declined, preferred, prefered, Detained, described, Discussed, Convened, intended, considered, finalized, confirmed, Provided, convinced, judgment, resolutions, Proceeded, included, Indicated, judgement, Establishing, established, appointed, recommended, designed, Testified, consultation, Picked, specified, ordered, initiated, Died, announced, Delivered, Assessed, instructed, implemented, judges, authorized, approved, promulgated, pronounced, Instigated, ended, Examined, ruled, checked, proclaimed, acknowledged, developed, apprehended, dismissed, estimated, destroyed, withheld, Introduced, Prosecuted, addressed, Dealt, come, Came, arranged, Stipulated, course, postponed, Succeeded, Caught, opted, fixed, Enacted, hired, delayed, command, imposed, found, refocused, adjusted, amended, Undertook, scheduled, rejected, dug, Commented, Managed, recognised, affected, verified, proposed, convicted, report, reported, Was, Were, AM, expected, settled, formulation, suggested, pledged, Switched, completed, revised, understood, mandated, drove, endorsed, Worked, Envisaged, noticed, question, government, liked, solved, reminded, attended, Began, spent, invited, affirmed, Arrived, sat, Audited, Rights, produced, expanded, Voted, ratified, Achieved, Viewed, retained, moved, figured, accepted, Reached, mechanism, extended, Abstained, spoke, Sentenced, Told, supported, recalled, recognized, Concurred, endeavoured, Submitted, measured, admitted, led, received, Wished, published, change, uttered, Ousted, stopped, Created, transformed, Responded, fired, place, Asked, changed, realized, finished, encouraged, observed, Launched, expressed, affixed, Believed, sought, Referred, Became, know, engaged, Transferred, quit, felt, Emerged, Avoided, said, shot, heard, 'd, stressed, treated, laid, Argued, closed, left, scheme, schemes, used, Awarded, Killed, Prompted, Mentioned, plan, planned, presented, Gave, attached, noted, signed, auto, raised, Negatived, attempted, Attracted, Rated, read, Regarded, started, stay, Stayed, promised, Carried, put, statue, entrusted, required, busted, failed, programme, Resulted, Stood, kept, wanted, granted, requested, called, turned, Brought, paid, let, released, Passed, saw, Gained, Visited, dropped, tried, mounted, fell, Took, thought, Allowed, Had, Returned, go, Went, applied, stated, Did, cut, 'il, Got, good, decision, decisions, resolve, committed, agreed, determining. 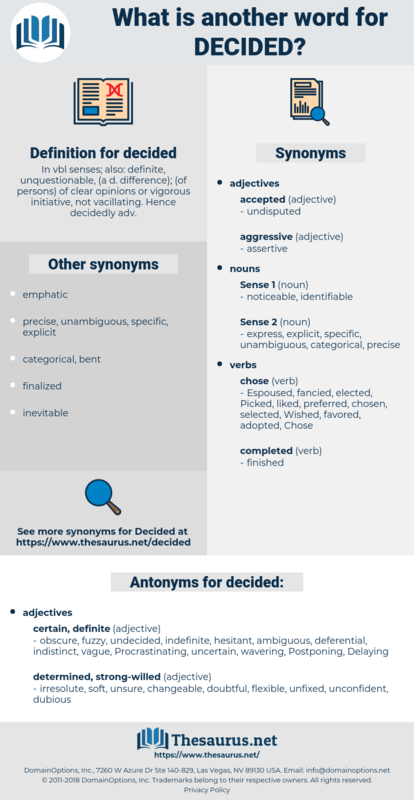 decidedthat, decidedto, Adjudicated, defined, ascertained, declared, dictated, dedicated, concluded, decreed, Excluded, directed, detected, Deemed, divided, discovered, predicted, deferred, jurisprudence, elected, deducted, Declined, designated, preferred, Detained, conclusions, described, Discussed, Administered, jurisdiction, accredited, intended, considered, finalized, confirmed, destined, Provided, discontinued, convinced, judgment, resolutions, proceed, minded, included, Indicated, judgement, prescribed, established, appointed, designed, divorced, nominated, judicata, Ceased, Picked, specified, conceived, governed, calculated, organised, calibrated, ordered, Compiled, initiated, allocated, perceived, finalised, condemned, announced, Delivered, Judged, Negotiated, clarified, Assessed, formulated, implemented, disposed, compelled, authorized, approved, pronounced, certified, ended, Examined, ruled, assigned, competence, classified, conducted, suspended, Attributed, acknowledged, developed, apprehended, dismissed, estimated, withheld, located, Introduced, Prosecuted, addressed, Adjudged, Dealt, anticipated, devoted, instalment, come, arranged, motivated, announcement, Stipulated, appreciated, recorded, postponed, conditioned, authorised, Caught, commissioner, Litigated, opted, fixed, corrected, Enacted, Excavated, delayed, sent, imposed, found, Undertaken, adjusted, amended, imprisoned, scheduled, rejected, opened, procedure, cleared, Managed, risen, election, immigration, recognised, affected, proposed, convicted, report, reported, regulated, expected, settled, driven, suggested, bound, handled, pledged, terminated, completed, concerned, continuity, revised, understood, mandated, reviewed, Drafted, topic, endorsed, Worked, needed, notice, noticed, shaped, government, Waived, solved, objection, foreseen, reduced, experienced, Adjourned, Been, spent, assumed, outlined, Begun, forecast, overcome, Arrived, produced, Voted, reference, separated, maintained, Achieved, Viewed, retained, moved, accepted, continued, strengthened, Reached, extended, system, Tackled, Sentenced, Told, aid, conference, built, Caused, recognized, Singled, Targeted, highlighted, Submitted, Enshrined, emphasized, Answered, measured, projected, traced, struck, HIT, doomed, led, received, drawn, valued, Shown, joined, stopped, Created, resolute, Responded, dated, poised, fired, spoken, assured, Asked, covered, changed, Earmarked, elaborated, finished, involved, encouraged, observed, Launched, become, expressed, Remained, affixed, Believed, Subjected, sought, limited, Referred, severed, Embraced, known, engaged, contained, placed, response, quit, Relied, felt, Emerged, Avoided, said, Enjoyed, Obtained, Performed, contracted, heard, award, stressed, treated, laid, Argued, closed, left, worn, processed, used, Awarded, given, secured, pursued, Killed, Prompted, Mentioned, planned, controlled, added, presented, attached, noted, permitted, Fitted, signed, raised, Rated, won, Accorded, read, Termed, Regarded, started, Shifted, promised, Carried, Acted, put, Entered, Followed, required, busted, seen, taken, failed, programme, Resulted, wanted, granted, requested, called, formed, Taxed, turned, Brought, paid, tabled, released, Passed, Served, B, Visited, tried, mounted, have, play, played, halted, thought, gone, based, Allowed, 19, Had, marked, Returned, applied, stated, Meant, Met, meetings, 26, done, cut, Got, decision, decisions, resolve, committed, agreed, determination. choose, arise, decision, decisions, dictate, resolve, rule, agree, agreed, govern, determining. obscure, fuzzy, undecided, indefinite, hesitant, ambiguous, deferential, indistinct, vague, Procrastinating, uncertain, wavering, Postponing, Delaying. irresolute, soft, unsure, changeable, doubtful, flexible, unfixed, unconfident, dubious. insensible, enigmatic, cryptic, unapparent, gray, imperceptible, slippery, cloudy, docile, indecipherable, impalpable, illegible, pliable, obedient, unknowable, subtle, dark, unintelligible, misty, tractable, unclear, hazy, amenable, indeterminate, undecipherable, unfathomable, gauzy, pliant, inappreciable, imprecise, incomprehensible, dutiful, mysterious, sketchy, murky, compliant, unclouded, submissive, clouded, noncommital, gentle, nebulous, nonobvious, complaisant, indiscernible, unreadable, yielding, teachable. It is quite enough that I tell you what she has decided. It was now early morning, though still dark, and all were tired, so it was decided that every one should go to bed. digitate, dziggetai, decade, deject, dicot, dig out, digit, dish out, decode, desist, desiccated, dissuade, dictate, do-si-do, death squad, deceit, dickie-seat, decked out, deck out, dissociate, deduct, decussate, disused, detest, diazoxide, decked, dagda, deceased, dickhead, dosed, dacoit, dioxide, detached, desiccate, dacite, decidua, detested, digest, dicky-seat, docket, dacoity, dissected, dogwood, dogtooth, dodge city, deist, duck shot, De Sade, ducat, dakota, detoxicate, dighted, do good, disquietude, dashed, dejected, die-cast, duct, dust, disquiet, death's head, dead set, detect, diskette, dogged, deuced, dedicate, detected, dytiscidae, death seat, duckweed, desuetude, dog-sized, dusty, disgust, dakoit, due south, digested, dickey-seat, destitute, dugout, dictated, disassociate, dasyatidae, dedicated, dockside, discoid, disguised, due east, due west, doughty, disquieted, dead weight, degust, diseased, disgusted, dissect, decayed, dished, decide, dazed, decoct, dakoity.